Because nothing says “Timely political content!” like a cameo from one of the most important political figures of 2016—recycling a joke that was getting long in the tooth back in 1998—CBS’s Murphy Brown reboot brought out the big guns tonight, drafting Hillary Clinton for a surprise appearance on its very first episode. The sequence with Clinton (applying to be Murphy’s secretary, complete with a painful reference to having “some experience with emails”) was kept a closely guarded secret by the network, which cut the bit from early-release review screeners. 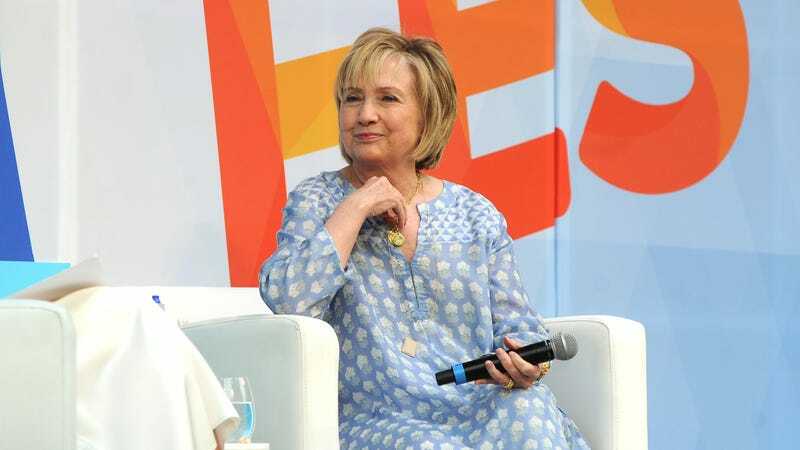 If nothing else, Clinton is building up a respectable TV resumé for herself, having previously appeared on Broad City and Saturday Night Live, and scheduled to appear on an upcoming episode of Madam Secretary (and also a ton of documentaries and talk show appearances, of course). It’s also her second trip to CBS Land in as many weeks, having landed at Colbert last Friday to talk up her latest book (and also the whole general state of the nation, post-2016). It’s quite the promotional tour, even if the Murphy Brown clip suggests she won’t get the job in question. Oh well: Can’t win ’em all.